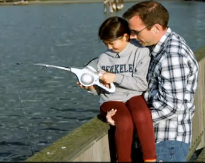 Nextsport has come up with a cool way to take the guesswork out of fishing. Picture this. You and your keep head out to the pier and drop your line in the water. Hours go by with no nibbles. The kids are whining, no one is catching anything, and the sun is beginning to beat down on you. You leave with an empty fish bucket and a headache. Sound familiar? Enter FishEyes. At first I thought this was a fishing pole, but what it really is is an ingenious way to determine if the fish are around or not. if the fish aren’t there, you can move to another spot and avoid a wasted morning with disappointed kids. Just drop the FishEyes line into the water. 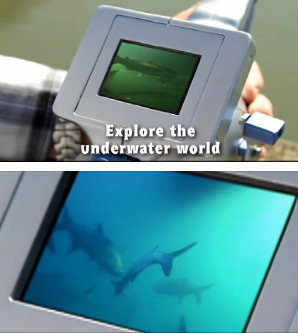 There’s a camera on the end of the line and a viewing screen on the rod. You’ll see a crystal clear picture of what swims below! FishEyes is meant mostly for pier and boat fishing. You drop it in and the bait basket will attract the fish, letting you see what’s swimming around. This tool works best when used in lakes, as rushing rivers will keep the camera moving around too much for a clear visual. FishEyes is not meant to be cast out, the camera is too heavy and will not allow for much distance. This tool is also great fun around the swimming pool. Drop the camera in and watch your kids swim! Take it to the beach, lower the camera in the water and search for treasures such as shells and starfish. Keep the Kids Busy with These Exciting Travel Games! Great Wolf Lodge: Fun in any weather!